The Fifty Shades of Grey fever might have cooled, but for the ladies of the new comedy Book Club it's only just heating up. 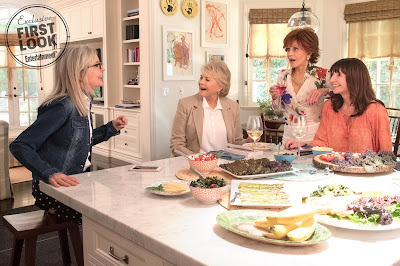 The film stars screen vets Jane Fonda, Candice Bergen, Diane Keaton, and Mary Steenburgen as four friends who decide to spice up their book club with a dose of Christian Grey. It's a good thing they went with E.L. James' books and not the passionless trilogy of movies, because the women experience a sexual reawakening thanks to the author's writing. Richard Dreyfuss, Craig T. Nelson, Don Johnson, and Andy Garcia play the men who add some adventure to the next chapter of their romantic lives.